The benchmark NIFTY50 suffered a modest down tick and saw some corrective pressure as it opened lower on Tuesday, made no attempts to recover and ended the day with net loss of 80.75 points or 0.73%. We may say that the pause in unabated rally in Equities was global in nature as the Asian and European Markets too saw modest corrective declines. Coming back to Indian Markets, while we go into trade on Wednesday, we expect such minor corrective pressure to persist as the Markets may adjust themselves before heading in to the Budget session on Thursday. We also expect market-wide volatility also to creep in and persist for some time which would include the front line Indices and the broader Markets as well. 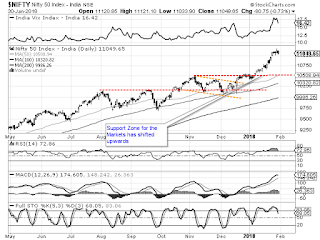 Wednesday will see the levels of 11090 and 11165 playing out as immediate resistance area while supports will come in at 10990 and 10940 zones. The Relative Strength Index – RSI on the Daily Chart is 72.8565. Though they remain modestly overbought, they stay neutral against the price showing no divergence against the price. The Daily MACD is still bullish. It currently trades above its signal line. No notable formations were seen on Candles. Pattern analysis shows the Market taking a breather after a strong run-up. In most likelihood, we can expect the Index to consolidate while resisting to 11,170 levels. 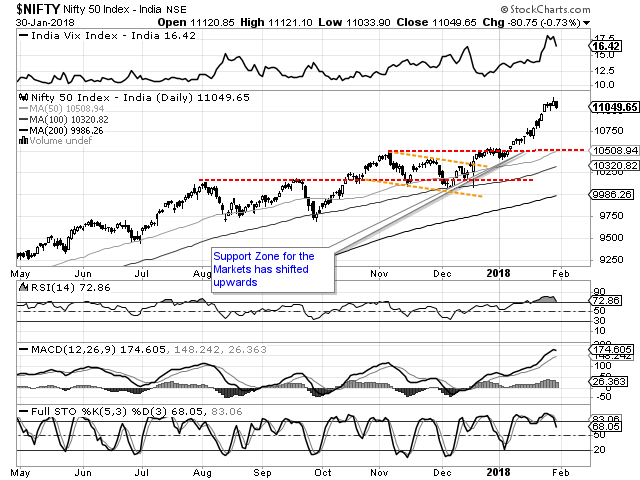 Unless there is resumption of rally fuelled by Union Budget, we will see this level of 11,170 acting as immediate top and the Markets resisting around those levels with limited downsides. All and all, it would be no surprise if the Markets see themselves getting volatile ahead of Budget Session on Thursday. Some lightening and churning of positions is expected and this is likely to lead to volatile movements. Some intermittent profit taking bouts too cannot be ruled out. Though the downsides are expected to remain limited, we recommend reducing overall exposures to moderate levels. It is also advised to preserve cash which would enable the trades to take further definitive directional bias post Union Budget. Continuance of cautious outlook is advised for the day.